Philadelphia, Pennsylvania (November 9, 2017) - Janney Montgomery Scott LLC (“Janney”), a leading full-service wealth management, financial services, and investment banking firm headquartered in Philadelphia, PA, has officially been certified by Maternity Care Coalition (MCC), an organization focused on helping improve the health and well-being of pregnant women, parents, and young children, as a Breastfeeding Friendly Employer. “Janney is proud to be the first financial services firm in Philadelphia to create spaces where employees who are mothers feel comfortable and supported in the workplace. Janney works tirelessly to create an inclusive culture, and is committed to providing its diverse workforce with the tools and resources they need to be successful,” said Nikki L. Kushin, Vice President, Head of Total Rewards, Janney. Janney worked closely with MCC to ensure that its facilities offer the necessary resources to breastfeeding mothers who are returning to work after maternity leave. Janney earned MCC’s certification after drafting and implementing a new breastfeeding friendly policy, as well as making adjustments to its wellness rooms with the guidance of MCC. MCC, founded nearly 40 years ago, has a comprehensive approach that includes public policy, research, and services for families. Since its creation, MCC has touched more than 100,000 families throughout southeastern Pennsylvania. "MCC applauds Janney for achieving best practice standards for workplace breastfeeding accommodations. 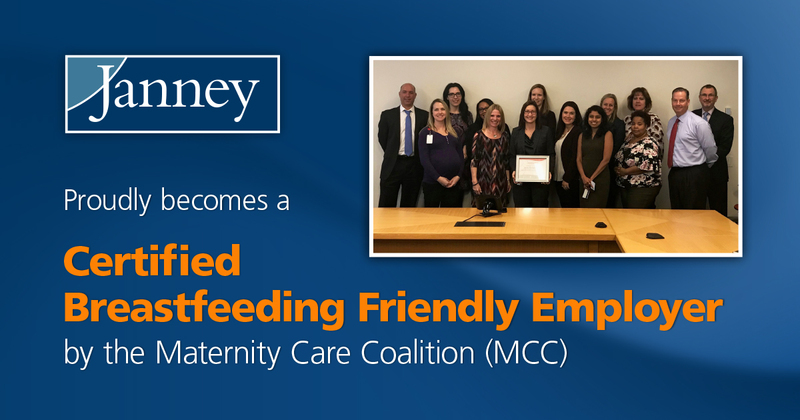 As our newest certified Breastfeeding Friendly Employer, Janney stands out as an employer of choice by helping working mothers to provide vital nourishment to their babies, while achieving their career goals," said Katja Pigur, Director of Breastfeeding Services, MCC.